Greetings, Arsians! The Dealmaster is back with another round of deals to share. Today's list is headlined by a modest but notable deal on Super Smash Bros. Ultimate, the latest entry in Nintendo's flagship fighting game series. It's just under $50 at Walmart and Amazon today. While that's only $10 off, it's the first significant discount we've seen on the game from major retailers, and deals on big first-party Switch games have generally been rare. If you've ever played a Smash Bros. game before, you should know what to expect here. You can read our giant review for more details, but the short version is that we called it nothing less than “the best fighting game on any Nintendo system.” It'll almost certainly go on sale for less in the future, but if you own a Switch and have been interested in jumping aboard while the game is still in the earlier part of its lifecycle, this looks like a decent entry point. 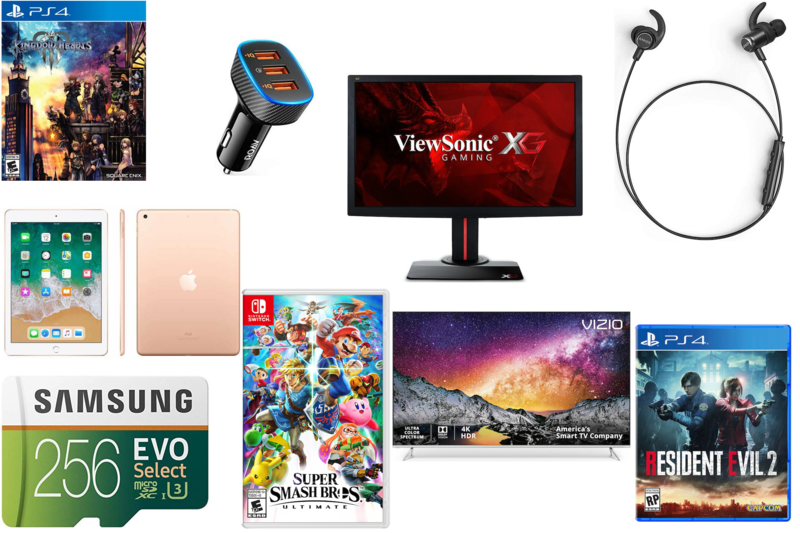 If Smash Bros. isn't your thing, we also have deals on other big-name games like Resident Evil 2 and Kingdom Hearts III, Vizio 4K TVs, Apple's 9.7-inch iPad, ViewSonic gaming monitors, and much more. Have a look for yourself below. Super Smash Bros. Ultimate (Switch) for $49.94 at Walmart and Amazon (list price $59.99). Resident Evil 2 (PS4, XB1) for $39.99 at Walmart and Amazon (list price $59.99). 55″ Vizio P55-F1 4K HDR LED TV + $200 Dell eGift Card for $699.99 at Dell (list price $999.99). 9.7″ Apple iPad (128GB) for $329.99 at Walmart (list price $429). Apple Watch Series 3 (38mm) for $199.99 at Walmart (list price $279). Anker SoundBuds Slim+ Bluetooth Sports Earphones for $21.99 at Amazon (use code: AKSLPLUS – list price $29.99). 27″ ViewSonic XG2702 Monitor – 1080p, TN, 1ms, 144Hz, FreeSync for $231.99 at Amazon (list price $289.99). 15% off sitewide ($60 max discount) with code: SAVE15 at Rakuten. Dell XPS 13 (9370) Laptop – Intel Core i7-8550U, 13.3″ 1080p, 8GB RAM, 256GB SSD for $1,049.99 at Dell (use code: 100OFF999 – list price $1,149.99). Dell XPS Tower Desktop – Intel Core i7-8700, 8GB RAM, 1TB HDD, 2GB GeForce GT 1030 for $749.99 at Dell (use code: 50OFF699 – list price $799.99). PowerA Wireless Controller for Nintendo Switch – GameCube Style for $39.99 at Amazon (list price $49.99). Red Dead Redemption 2 (PS4, XB1) for $39 at Amazon (list price $59.99). 55″ TCL 55R617 4K HDR LED Roku TV for $549.99 at Walmart and Amazon (list price $599.99). 65″ TCL 65S517 4K LED Roku TV for $599.99 at Amazon (list price $649.99). Antennas Direct ClearStream Eclipse TV Antenna (35 Mile) for $31.99 at Amazon (list price $39.99). Netgear CM500 Cable Modem – 16×4, DOCSIS 3.0 for $44.99 at Amazon (clip $10 coupon – list price $54.99). Google Home Hub for $99.99 at Woot (list price $149.99). Anker 5-in-1 USB-C Hub – 3x USB 3.0, HDMI, Ethernet for $35.99 at Amazon (clip 10% coupon – list price $54.99). Anker Roav SmartCharge Halo Car Charger – 30W, 3x USB-A for $13.99 at Amazon (use code: ROAVF3WA – list price $19.99). Anker PowerLine+ USB-C to USB-A 2.0 Cable (2-pack, 3ft) for $7.99 at Amazon (use code: ANKERB82 – list price $9.99). Anker PowerCore 15000 Redux Portable Battery – 2x USB-A for $33.99 at Amazon (list price $40.99).